Proteins are one of the most essential nutrients required by the human body. It is one of the most known nutrients to people because these are necessary for building muscles of the body. Moreover, the body of an average person contains about 15% proteins by weight. Proteins are organic molecules that are made of amino acids which include carbon, hydrogen, sulfur, oxygen, and nitrogen. 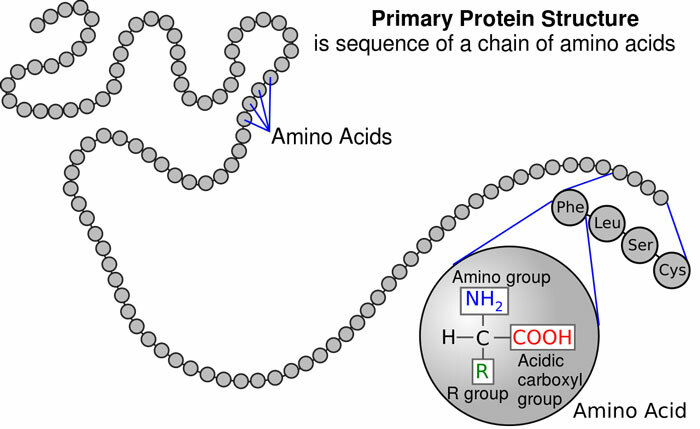 Amino acids in long chains make the proteins, and these proteins are the bases for the muscular mass in the human body. Our body is able to make some types of amino acids, but we also require to eat certain foods to get other amino acids that our body can’t produce for making proteins. Proteins are required for a large number of cellular functions that are essential for keeping a person healthy and alive. Proteins are almost used by every cell in the human body for Copying the DNA, making the structure for cells, and responding to the stimuli, etc. Catalyst Proteins – Most of the enzymes are proteins which acts as catalysts in the chemical reaction of the body and inside the cell. These proteins actually help the chemical reaction by increasing their speed of reaction. Structural Proteins – These types of proteins make the structure of the body and the cells. Transport Proteins – These types of proteins helps our body in carrying nutrients. For example, hemoglobin in red blood cells are proteins which carry the oxygen from the lungs and supply it to every part of the body. The cells in our body are responsible for the production of proteins. The process of production of proteins is known as protein synthesis. All the instruction of making different types of proteins are stored in the DNA. There are two major stages in the production of proteins, which are transcription and translation. Transcription – It is the first stage in the production of proteins in which cells replicate the DNA. This replicate of DNA is known as RNA (Ribonucleic acid). Translation – In this stage, the RNA that was produced in the transcription stage is now converted into a specific sequence of amino acids to produce a certain type of protein. All the processes of translation stage happen in an organelle inside cells, known as ribosomes. Many kinds of amino acids in our body are acquired from the meat that we eat and dairy products. We also get some amino acids from vegetables. Keratin is a protein in the human body which is responsible for the making of hair. Abdul Wahab, "Proteins," in Science4Fun, April 12, 2019, http://science4fun.info/proteins/.